Coral trouts are among the most sought-after reef fishes for their impressive appearance and fine eating qualities. Their delicate flavour and fine, white flakes appeal to most. Bake, steam, poach or grill, but avoid handling them too much as their delicate flakes can be easily damaged. Enrich with an abundance of citrus, light butter sauces, parsley and chives. The cheek flesh from coral trouts is very highly regarded and should not be wasted. Price: Coral trout are high-priced finfish. To accentuate the sweet and piquant flavours of these species, it is important to select table wines with subtle varietal characteristics and understated flavours. Cool climate white wines are preferred and varieties such as sauvignon blanc, semillon, or blends of both are suitable. Caught year round in saltwater near reef areas with peak supply from September until November. The coral trouts (Plectropomus spp) are often separated from the coronation trouts (Variola spp) in the marketplace. They can grow from 40-80cm Coral trout weighing 0.6-1.0 kg are sometimes called ‘plate size’. Habitat Saltwater, Caught near reef areas. The scarlet or red coloured coral trout are typically taken in deep water (up to 100 m). The coral trouts (Plectropomus spp) are often separated from the coronation trouts (Variola spp) in the marketplace. Coral trouts often have black parasites on the inside of the belly flap but these are not a food safety issue. Grading can vary by supplier and region. 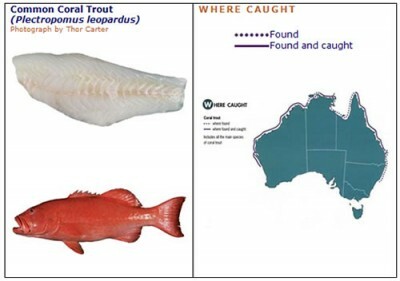 An example of a grading system for whole coral trout is presented below.